Driveway lighting can help avoid accidents, guide traffic, make your home easier to find, and show off your landscaping or hardscapes. It can increase the safety of your guests and the security of your property, while also increasing your home’s curb appeal, and should definitely be included in your overall landscape lighting plan. To help you determine the type of outdoor lighting that is best for your property, here are nine reasons to install driveway lights, as well as 10 tips and ideas for choosing the right lights for your project.  Define Driveway Borders: Driveway lights are often used to define the borders of a driveway. This helps guide your guests to the parking area, protects landscaping adjacent to your driveway and provides overall lighting for the area. Increase Security: A well-lit driveway, yard and home can dissuade potential intruders and help make your home more secure. Increase Safety: Landscape lighting provides necessary illumination to make driving and walking on your property safer. It reduces the chance of tripping in dimly lit areas and can be a critical safety component for some driveways. For example, if your driveway has a narrow entrance, bridge, large trees or a drop off along the sides, driveway lighting can be positioned to mark boundaries and alert drivers to potential hazards. Make Your Home Easier to Find: Marking the end of your driveway with easy-to-see light fixtures makes your driveway easier to find at night. This can help you, your family and your guests more easily find your home, particularly on country roads and roads with few or no streetlights. Impress Your Guests: If your house sits back from the road, your driveway may be the first thing your guests see as they arrive and, therefore, will be an important part of the first impression they have of your home. 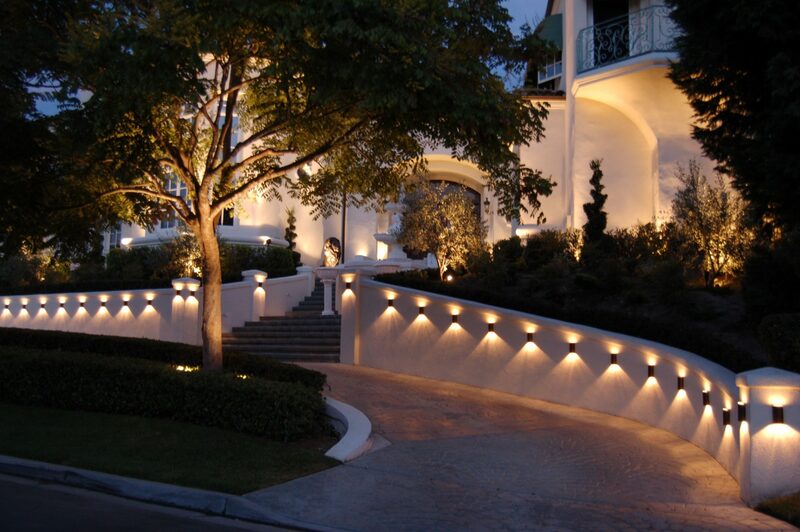 Even for homes with short driveways, lighting can increase curb appeal and enhance your home’s appearance. Guide Traffic: Driveway lighting is an easy, effective way to guide traffic. This could mean directing guests to a designated parking area or directing foot traffic to your front door. Illuminate Parking Areas: This one could be included under safety, since it does increase the safety of you and your guests. However, outdoor lighting can also be used to clearly mark parking areas so that your guests know where it is and is not okay to park. Protect Structures: Outdoor lighting can certainly help protect your guests, but you can also use it to protect structures on your property. This might include walls, carport posts, garage doors or landscaping features that drivers may find difficult to see. Enhance the Experience: If you have a particularly long driveway, you can go beyond safety-related illumination to make the drive from the road to your house more interesting. For example, you can use outdoor lighting to highlight interesting trees or landscaping features along your driveway or, if you have an attractive driveway, you can position lighting to show off different patterns or colors in your paving stones or stamped concrete. 1. Consider using post lights or pillars at the end of your driveway to create a more dramatic entrance and make your property easier to find. 2. If you are interested in installing recessed lighting in your driveway, it is best to take this into consideration before installing your driveway. Choose a company that installs both hardscapes and landscape lighting so that they can handle both aspects of the design process with you or, if you are using separate contractors, make sure to connect them early on so that they can work together to design and plan the project. 3. Motion sensor lights in parking areas and near walkways are a great choice for increasing the security of your property and the safety of your guests. 4. Driveway lighting should be part of your overall landscape lighting design to ensure a cohesive look throughout your property. 5. If your home has a short driveway, you may find that sufficient illumination can be achieved solely from outdoor lights affixed to your home, such as on either side of your garage door. 6. 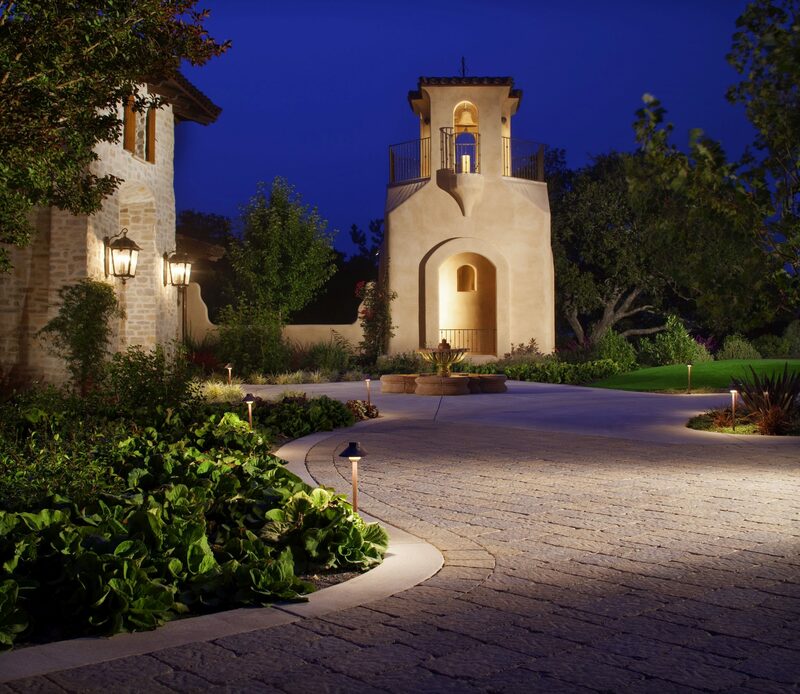 Longer driveways can benefit from a combination of light fixtures that include boundary markers and downlights to illuminate larger areas, particularly areas with tight curves or other potential hazards. 7. Opting for solar driveway lights negates the need to run electricity down a long driveway and the need to bury or hide the wires. However, driveways with a lot of trees or landscaping may not be good candidates for solar lights. Talk to your outdoor lighting installer to determine if solar or wired lights are a better choice for your project. 8. 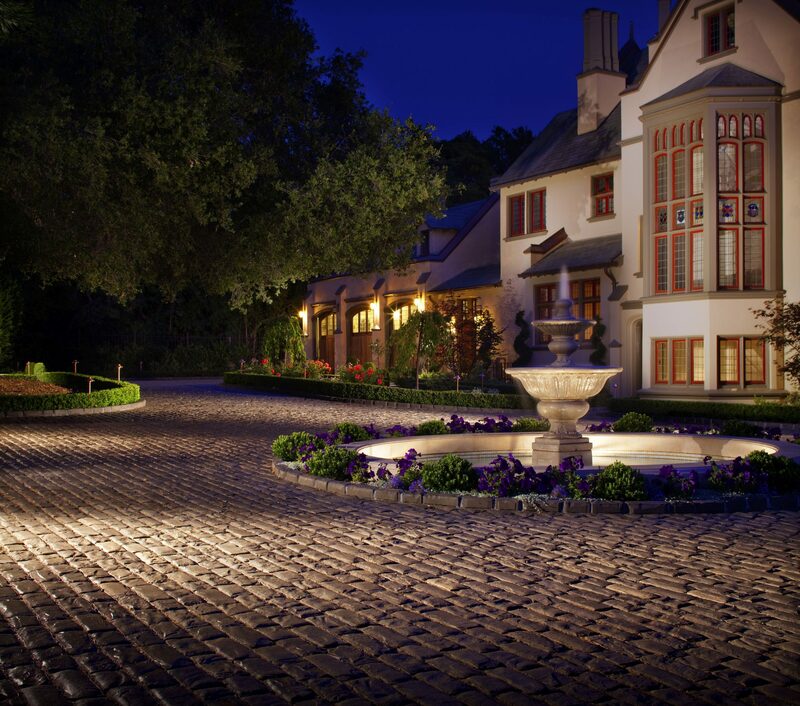 Uplights serve the dual purpose of illuminating your driveway area while also highlighting landscaping features or architectural points of interest. 9. Downlights positioned high in trees can bathe your driveway with a more natural-looking, moonlit glow that can be a welcoming visual when arriving home from a long day or as guests arrive to stay for the weekend. 10. The outdoor lighting often seen in home improvement stores or at big box stores may make it seem like there are limited options available. Do not be discouraged by this. 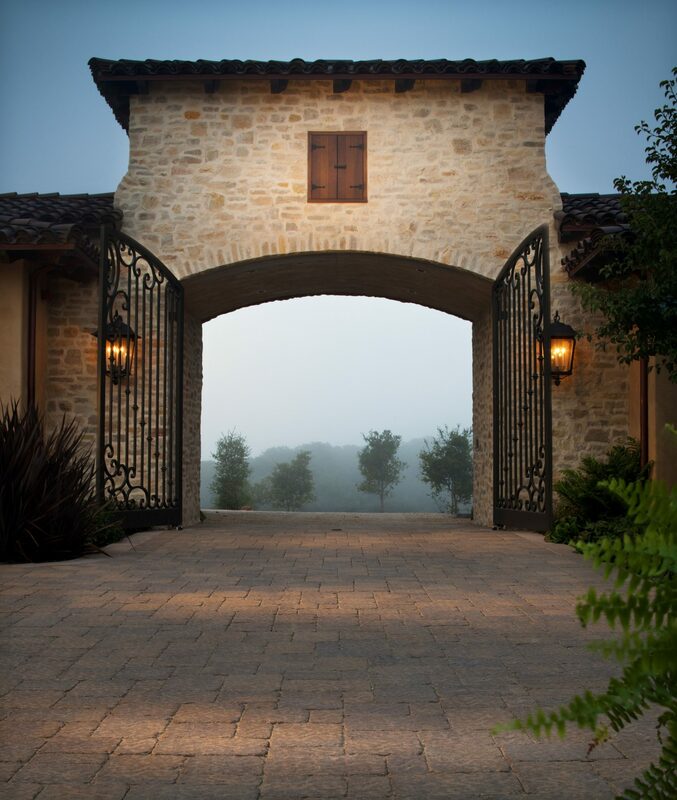 Outdoor light fixtures come in a wide variety of styles, which means you should have no problem finding the right driveway lights to complement your landscaping and the architectural style of your home. So, while it is absolutely fine to start getting ideas next time you are at your local home improvement center to pick up fertilizer or a new rake, work with a professional landscape lighting company when you are ready to design your lighting and move forward with your project. If you have questions about driveway lighting or are ready to get started on your landscape lighting project, contact Install-It-Direct at (858) 925-3000 to speak to a design consultant today.